USA 10 Coins 50 State Quarters Proof Set (US Mint, 2003) Buyer. San Francisco Mint. Includes Kennedy Half Dollar, Roosevelt dime, Lincoln cent, Jefferson Nickel and Sacagawea dollar. 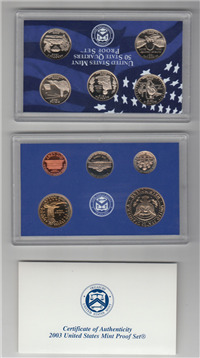 The fivequarters in this set are Illinois, Alabama, Maine, Missouri, and Arkansas. 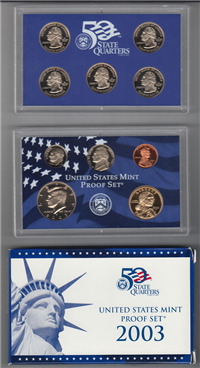 All are housed in the original U.S. Mint plastic cases and contained in a blue U.S. Mint box, and including a certificate of authenticity describing the coins. 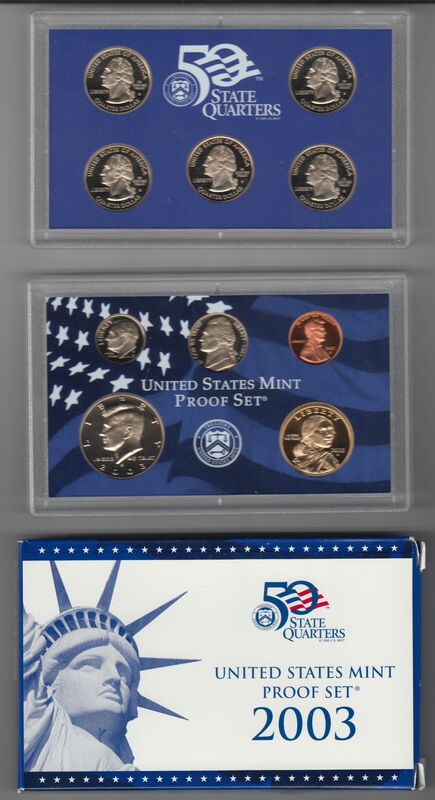 The United States Mint certifies this 10-coin set contains only genuine United States Mint proof coins, produced to the exacting standards of the artisans and craftsmen of the United States Mint. Each coin bears the "S" mint mark of the United States Mint at San Francisco and is produced from carefully selected planchets, or coin blanks, that have been burnished to a high luster.